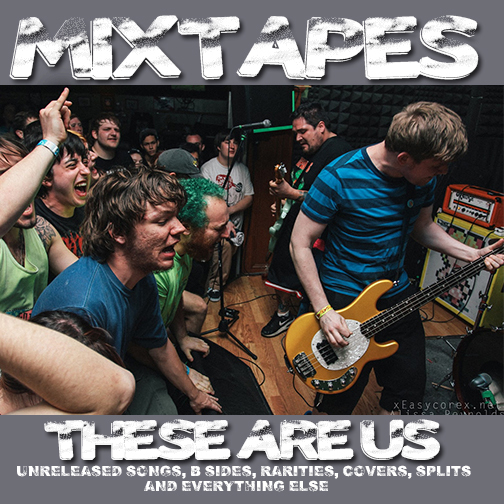 I Mixtapes (o quello che ne rimane visto che la band si è sciolta) hanno deciso di rilasciare in free download l’album These Are Us, una compilation di inediti, rarità, B-sides, cover, split e altro. Per il link cliccate qui. “…..I was at Eric’s house the other day, who is the guy that recorded and engineered all of the Mixtapes records. We were going through stuff and joking around and realized we had quite a few songs no one had ever heard,including myself more than once or twice. A few of them I thought “why on earth didn’t we put this on a record?”. Then I remembered that Weezer also didn’t put Susanne on a record and we all make mistakes. At that point I decided we should put out a free download of all of our unreleased material, rare material, splits and just things in general that might not be so easy to get anymore. After clearing it with the suits and tracking down all of the songs, in part thanks to some listeners I did it. So here it is, sequenced with artwork and ending with something very special. We are really proud of the songs and there’s no reason they shouldn’t be available if you like our band so please download it, share it, post it etc etc. The last song on this record is something near and dear to me. One day while recording “Even on the worst nights” everyone went to breakfast. I stayed behind, clicked record in the studio and put myself in the mindset of a high school non conformist goth kid. What came out was 15 minutes of completely freestyled angst that I could never repeat or pull off again, so please while listening feel my pain. But really, we are excited to release this all on one record and thanks to Vinnie for putting it out and being the best, we love you!